Brittany Murphy is a famous American actress and singer. She became famous after the release of the films Clueless, Girl, Interrupted, 8 Mile. In 2009, the woman passed away under dubious circumstances. Thus, one day Brittany’s death scandal subsides, another day spreads again. Brittany Murphy (born Brittany Anne Bertolotti) was born on November 10, 1977. The girl's father was Angelo Bertolotti, a crime boss of Italian and American descent. At the time of his daughter’s birth, he had already been convicted of looting and racketeering. When Brittany was about three years old, Angelo filed for divorce and left the family. The mother of the future actress, Sharon Murphy, has Irish and Jewish ancestry. Of course, after the divorce, she brought up her daughter. It was the reason for Brittany to take the mother's name at a young age. The girl spent her childhood in the township of Edison, New Jersey. At the age of nine, the young actress already performed in one of the town’s theaters, brilliantly portraying the characters in the musicals Really Rosie and Les Misérables. Sharon supported her daughter’s creativity, and at 13, Brittany already had a manager. While studying at school, she auditioned for commercials. Her first serious work was the advertisement for the restaurant chain Pizza Hut. Brittany’s mother quit the job and moved to California to pursue her daughter’s acting career. Young Murphy soon got the role in advertising for the famous sweets Skittles. At the same time, Brittany appeared on the big screen. The girl got a small role in the TV series Blossom. Murphy’s first projects in the cinema are the television series Drexell's Class, where the actress got a more significant role, but unfortunately, the series did not air for a long time. She played a more prominent role in the funny youth comedy Clueless, which appeared in 1995. Brittany portrayed a friend and classmate of the title character, Alicia Silverstone. In 1998, Brittany performed the leading female role in the television film David and Lisa, which is little known in Russia. Nevertheless, the actress was nominated for the prestigious Young Artists Award, which meant that directors noticed Murphy. A real breakthrough in her career was the participation in the film Girl, Interrupted. The movie was released in 1999 and was a stunning success. The story tells about a girl who got into a psychiatric hospital after a suicide attempt. The film shows other patients of the clinic, tells their life stories, reveals the efforts of young girls to understand themselves. Angelina Jolie and Winona Ryder played the title roles in the film. 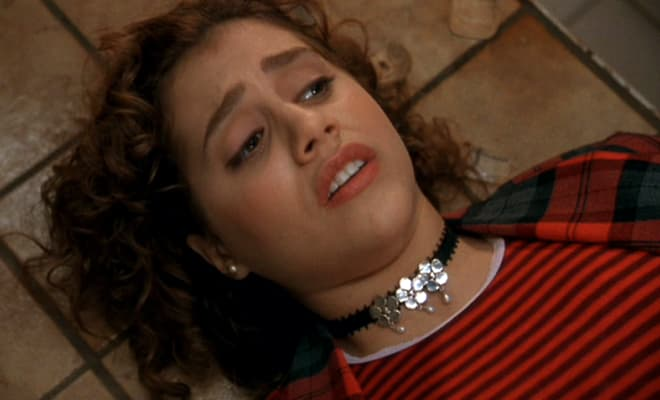 Brittany Murphy soon had to portray a mentally ill girl in one more famous movie Don't Say a Word. This psychological thriller film was released in 2001. Besides Murphy, Sean Bean and Michael Douglas played the leading roles. Murphy was lucky to work with eminent actors again. Later, Brittany starred in the films 8 Mile (her partner on the set was the famous rapper, Eminem) and Uptown Girls (the actress played in duet with young Dakota Fanning). The actress got the title role in the film Spun, where Murphy’s colleagues on the set were Mickey Rourke and John Leguizamo. In 2005, the actress’s filmography included the move Sin City, where Quentin Tarantino was a special guest director. A year later, Brittany starred in two films. The comedy Love and Other Disasters tells about a girl, Jackson, who is trying to improve her friends’ personal lives. The beautiful lady loves the movie Breakfast at Tiffany's with Audrey Hepburn and even imitates her favorite heroine. The drama The Dead Girl tells about the murder of a young girl, Krista. The film is presented in five parts, each of them shows the life of one heroine who is somehow connected with the murdered girl. Murphy played the role of Krista. The same year, Brittany has a voice role. She voiced Gloria in the cartoon Happy Feet. In 2007, the animated film won an Oscar. Brittany got a leading role in the movie The Ramen Girl about a girl who came to Japan to learn how to cook ramen. Murphy was also the producer of this film. Shortly before the actress’s death, two films Tribute and Across the Hall were released. After her death, three more films Megafault, Abandoned and Something Wicked with Murphy were released. The young actress mainly portrayed girls with hard luck, who suffered a lot and had troubles. According to family members and Brittany’s friends, the actress distinguished herself as a cheerful and sociable girl with a smooth temper. She was not only an actress. Murphy fulfilled her potential as a singer. The girl sang in the band Blessed Soul with fellow actor Eric Balfour in the early 1990s. They recorded the soundtracks to the films Girl, Interrupted and Riding in Cars with Boys. In 2006, Brittany and DJ Paul Oakenfold released the single "Faster Kill Pussycat," which became a club hit. Brittany Murphy and DJ Paul Oakenfold’s music video "Faster Kill Pussycat." She starred in the music videos for the singes "Here," "A Little Respect," "Closest Thing to Heaven" and "Faster Kill Pussycat." Smart and slim (her height was 160 cm) Brittany often caught men’s hearts. At school, she dated the actor of the teenage series Seaquest DSV, Jonathan Brandis. According to reporters, while shooting in the movie 8 Mile, Murphy’s boyfriend was Eminem. There is no exact information, but it is known for sure that in 2002, Ashton Kutcher began dating Brittany. However, this love affair did not last too long. There is no the famous actor in Murphy's wedding photos. By the way, he later became Demi Moore’s husband. In 2004, the actress announced her engagement with producer Jeff Kwatinetz, but this relationship soon came to an end. Brittany married screenwriter Simon Monjack. The wedding was held in May 2007. The couple did not have children. In the early 2000s, viewers noticed that the actress lost a lot of weight. Some journalists wrote that she got addicted to cocaine. In 2005 the woman denied these rumors, saying that she had never tried drugs. Artists’ fans often notice that their idols have celebrity twins, who do not belong to their relatives. So, Keira Knightley was often confused with Natalie Portman, Zooey Deschanel with singer Katy Perry, actor Jeffrey Dean Morgan with colleague Javier Bardem. There is also a celebrity that looks like dearly departed Brittany Murphy. It is a young actress, Lili Reinhart, a star of the series Riverdale. The young actress said in an interview that some consider her to be reborn Brittany. 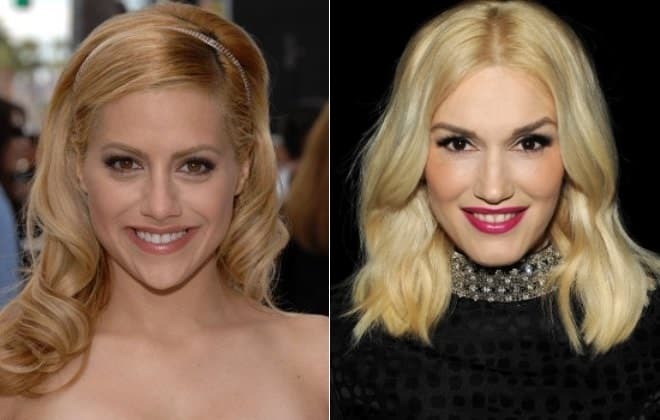 Brittany Murphy was also considered to be a celebrity twin of singer Gwen Stefani. Brittany Murphy died suddenly on December 20, 2009. At that time, she was 32 years old. As well as deceased Heath Ledger in 2008, Brittany left behind brilliant roles and millions of fans who saddened deeply after the untimely death of their idol. It is interesting that after the death of both artists there were videos, where Ledger was in the image of his hero, Joker, and Murphy appeared as a girlfriend of villain Harley Quinn. The primary cause of Murphy's death was a heart attack. Her mother found the unconscious actress in the bathroom of her house in Los Angeles. Sharon called an ambulance, which tried to reanimate the young woman, but they failed to do it on the scene as well as on the way to the hospital. When Brittany was transported to Cedars-Sinai Medical Center, doctors could only certify the patient’s death. When the news about the actress’s death spread, many celebrities expressed their condolences to Murphy’s family. Ashton Kutcher wrote in a blog: "2day the world lost a little piece of sunshine. My deepest condolences go out 2 Brittany’s family, her husband, & her amazing mother, Sharon. See you on the other side, kid. " Singer Jessica Simpson tweeted: "Brittany Murphy was an incredible ray of Light to so many people. Her smile was contagious." Murphy's funeral took place on December 24 in the Hollywood Hills. The grave of the deceased actress is at Forest Lawn Memorial Park. Why such a young girl passed away is a question without an answer. The forensic experts who performed the autopsy said that she died of pneumonia complicated by multiple drug intoxication. After his wife’s death, Simon Monjack said that she visited the doctor and was treated. But the investigators found out that Brittany went to the doctor for a long time, and then she began to treat on her own. Murphy's friends persuaded the police to question Simon, but Monjack was never suspected of his wife's death. Soon after Brittany’s death, her husband died suddenly on May 23, 2010. The police immediately considered the toxic mold to be a possible cause of the deaths. Murphy's father demanded independent testing, which showed ten types of heavy metals in Brittany’s blood, skin and hair samples. There was a suspicion that the young woman was deliberately poisoned. Some journalists even noticed that shortly before Brittany's death, the actress lost a lot of weight, and suggested that the cause of her death was an extreme diet. Angelo Bertolotti continued to investigate the real cause of his daughter's death. The man said in an interview that the actress was killed. Brittany’s father believed that her mother, Sharon, was guilty. Angelo claimed that she killed the woman with rat poison. Allegedly, her mother had grounds for this, because she inherited all property. Brittany’s father claimed that the woman wanted to stop the daughter who desired to go to New York and start with a clean sheet. Murphy thought about pregnancy. Bertolotti camp on the police doorstep for a long time to clear the daughter’s name, who was accused of drugs abuse and anorexia. But in 2016, his efforts came to naught because of health problems. He did not stop blaming the former wife for his daughter's death. In 2014, director Joe Menendez released the biographical film about the actress’s life entitled The Brittany Murphy Story. Amanda Fuller played the leading role in the movie. Although the woman passed away almost ten years ago, her close friends and fans are still trying to solve the mystery of their favorite actress’s death. Fans do not stop loving and admiring Brittany Murphy’s talent. Therefore, there is her fan page on Instagram, where fans post the actress’s personal and working photos, found on the Internet.